The pan-Arab London daily al-Hayat [Life] reports in Arabic that sources close to the two major Shiite coalitions have revealed that they will form a 10-person committee of “wise men” to choose the country’s prime minister. The “wise men” will consist of or include prominent Shiite clerics chosen by Grand Ayatollah Ali Sistani, the spiritual leader of the Shiites, according to AP. The move comes in the wake of the sudden announcement the night before last that the Iraqi National Alliance (Sadrists, Islamic Supreme Council of Iraq, some others) and the State of Law (Islamic Mission Party or Da’wa and some others) will form a broad coalition. The step gives them a combined tally of 159 of 325 seats in parliament, only 4 short of the 51% required to form a government on the second ballot and then to rule effectively. Likely they will nevertheless seek to form a government of national unity. The secular Iraqiya list, for which most Sunni Arabs voted denounced the move as having been orchestrated by Iran and returning Iraq to the sway of sectarian religious parties. But Iraqiya failed to form a government in its own right in part because of frictions between Sunni Arabs in the North and Kurds in the East, over the division of spoils. The Shiite religious parties denied that they had already fixed on former prime minister Ibrahim Jaafari, who was widely viewed as ineffectual in 2005-2006. Still, the announcement of the new coalition was made in Jaafari’s house in Baghdad, which is unlikely to be completely without significance. The clerical committee will choose among Ibrahim Jaafari, Adil Abdul Mahdi (current vice president and member of the Islamic Supreme Council of Iraq), Baqir Jabr and incumbent PM Nuri al-Maliki. 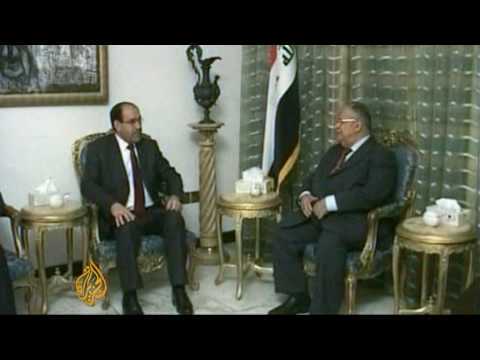 Al-Maliki is fiercely disliked by the Sadr Movement, which controls some 40 seats in the new parliament, because he deployed the Iraqi military against their Mahdi Army militiamen in 2008. Some major clerics in the holy cities of Najaf and Karbala have also been extremely fierce critics of al-Maliki. The Iraqi National Movement or Iraqiya, headed by former interim prime minister Iyad Allawi, denounced the Shiite super-coalition as a return to the bad old days of sectarian rule (i.e. 2005-2010) and said it was a move intended to exclude their party. Still, the Islamic Supreme Council of Iraq, headed by Ammar al-Hakim, insisted that it would not serve in any government that excluded any major party.